Google mail is the account with all the latest functionalities and email features. Gmail provides ultimate protection against any threat and also prevents unwanted access. Google mail can be accessed across various platforms in different ways. Normally Gmail can be accessed on the web portal easily on your PC and it can be accessed on your handsets using an app. Are you using Gmail app to access to emails on the handsets? 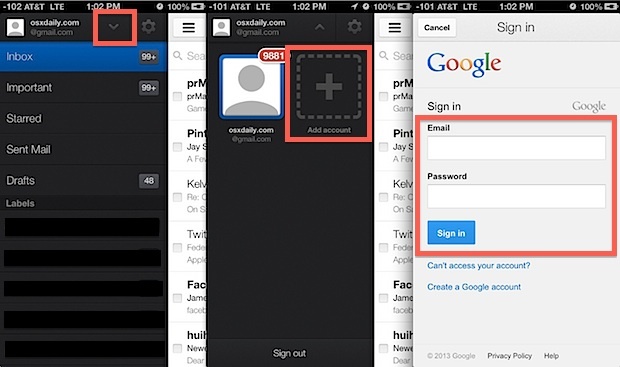 Add another account on Gmail app easily on your mobile. Using the app on the Android device, user can read and send emails. User can forward the mails from one account to the other but user can also add that account on the Gmail app. First open the Gmail app and tap ‘Menu’ in the top-left. Tap the Down arrow to the right of the username. Next tap on ‘Add Account’. Choose the type of account needs to be added. Select ‘Exchange and Office 365’ in case of using Office 365, select ‘Outlook. Hotmail, and Live’ if you check emails through Outlook for Windows. Select ‘Others’ if the user don’t have any other email service. Not able to add another email account on Gmail app? Contact the Gmail team for user assistance and support. Support professionals will solve any or various problems with the Google account instantly.